Definition at line 70 of file make.c. 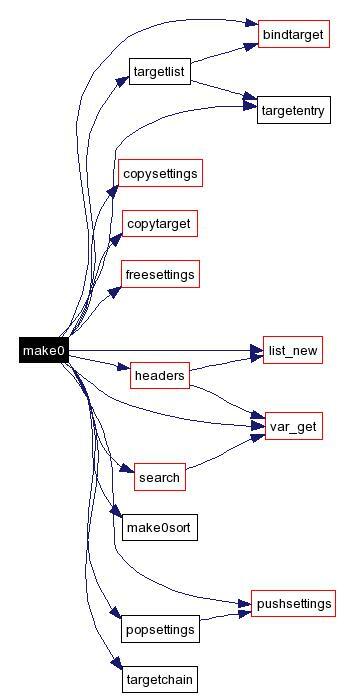 Referenced by MPColorFeatSearch::addBoxCorners(), ModeData::addData(), collect_arguments(), ScalePyramid::compute_scales(), MPColorTools::DrawRGBBox(), FaceObject::findMax(), MPBlink::get_eyes(), ScalePyramid::get_shiftamount(), MPColorFeatSearch::getBoxSum(), main(), make0(), ModeData::ModeData(), MPIScaledImage::MPIScaledImage(), ObjectList::overlap(), MPColorTools::RGBtoHSV(), MPColorFeatSearch::searchFeature(), MPEyeFinder::setROI(), FilterInterface::ShowBlinkResults(), ModeData::subData(), Cluster::UpdateCluster(), and MPISearchThread::UpdateColorModel(). Definition at line 103 of file make.c. Definition at line 777 of file make.c. Definition at line 110 of file make.c. 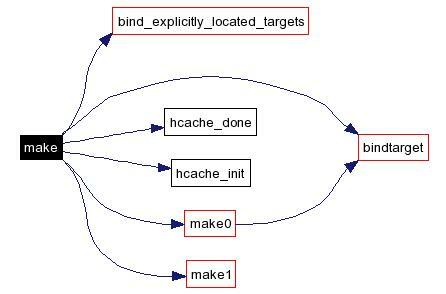 References bind_explicitly_located_targets(), bindtarget(), hcache_done(), hcache_init(), i, make0(), make1(), and TARGET. 00126        needed to correctly handle dependencies to generated headers. Definition at line 187 of file make.c. References _target::actions, _target::binding, bindtarget(), _target::boundname, c, COUNTS::cantfind, COUNTS::cantmake, copysettings(), copytarget(), DEBUG_FATE, _target::depends, _target::fate, _target::flags, freesettings(), headers(), _target::includes, L0, _target::leaf, LIST, list_new(), make0sort(), max, _target::name, _targets::next, _target::original_target, p, popsettings(), _target::progress, pushsettings(), s, search(), SETTINGS, _target::settings, spaces, _list::string, T_BIND_EXISTS, T_BIND_MISSING, T_BIND_PARENTS, T_BIND_UNBOUND, T_FATE_BROKEN, T_FATE_BUILD, T_FATE_CANTMAKE, T_FATE_MAKING, T_FATE_MISSING, T_FLAG_TEMP, TARGET, _targets::target, target_bind, target_fate, targetchain(), targetentry(), targetlist(), TARGETS, COUNTS::targets, COUNTS::temp, _target::time, COUNTS::updating, and var_get(). Referenced by make(), and make1c(). 00219          * bind the target and search for headers. 00400          * the temp source will need building. 00408          * If a NOUPDATE file exists, make dependents eternally old. 00410          * based only upon other flags and our binding (done later). 00428              * based only upon other flags and our binding (done later). 00438                 If can't find or make child, can't make target. 00439                 If children changed, make target. 00440                 If target missing, make it. 00441                 If children newer, make target. 00442                 If temp's children newer than parent, make temp. 00443                 If temp's headers newer than parent, make temp. 00444                 If deliberately touched, make it. 00445                 If up-to-date temp file present, use it. 00446                 If target newer than non-notfile parent, mark target newer. 00451                 fate is getting stabler. 00537                     printf( "fate change  %s to STABLE from %s, "
00559          * Step 5: sort dependents by their update time. 00602 /* We don't have DEBUG_CAUSES. Definition at line 726 of file make.c. References c, _targets::next, s, _targets::tail, _targets::target, TARGETS, and _target::time. Definition at line 767 of file make.c. Referenced by builtin_update(), and main(). Definition at line 772 of file make.c. Definition at line 95 of file make.c. Definition at line 79 of file make.c. Definition at line 765 of file make.c. Referenced by clear_targets_to_update(), and mark_target_for_updating().